On September 11, 2018 at 3:37 pm, Lorena Suggs Morris, age 78, threw off these earthly bonds of sickness and disease and entered the gates of Heaven, to be welcomed by her Savior. She was surrounded by family and friends who loved and cherished her and will continue to love and cherish her memory for the remainder of their lives. A celebration of her life is planned for Saturday, September 15, 2018 at 10 am at Faith Tabernacle Church with Pastor Don Stanton officiating. Interment will follow in Grandview Cemetery in Kaw City, OK. Friends and family may pay their respects at the funeral home on Thursday, September 13th, 2018 5:00 pm to 8:00 pm and Friday, September 14, 2018 from 8:00 am to 8:00 pm. Arrangements are under the direction of Trout Funeral Home & Crematory. Lorena was born to Jack and Rena Asher on March 15, 1940 in the home of her grandparents Jake and Maggie Hargraves in Little Kansas, OK. Her parents divorced when she was an infant and her mother was later remarried to Tommie Suggs, when Lorena was three years old. Tommie became Daddy to her for the rest of her life and after she retired, she cared for him the rest of his life. She lived with her parents in Grand Canyon Village, AZ where she started school, Wichita, KS, Ponca City, OK, and finally Burbank, OK where she graduated high school, class of 1958. She married Jess LaRue Morris on September 12, 1959 and they made their first home in Ponca City where they welcomed their first child, son Tommie Morris in 1960. They then moved to Arkansas City, KS. They were blessed with a daughter, Christie Jo in 1963 and a son, Tod Ray in 1968. They spent many happy years in Ark City and enjoyed the benefits of small town living. Lorena and Jess divorced in 1976, but remained life-long friends. Lorena began a new chapter of her life in 1975 when she and her sister, Sandy Suggs, attended St. Joseph School of Nursing in Wichita, KS. They graduated in 1977 as Registered Nurses, after taking and passing state board exams. She began her nursing career at St. Joseph Hospital in Ponca City and worked several positions, including circulating nurse in surgery. While working in surgery she met Debbie Day who was to become her best friend and companion. They enjoyed many travels, cruises, and just shopping together. The last phase of her nursing career began in November of 1993 when she became the nurse for Dr. Jackie Garland in her family practice. This was her favorite job and she became close friends with Dr. Garland and “the girls”, fellow nurses Joy Pascher, Oresa McKnight, and Susan Parton who remained her friends until the end. After retirement in 2007, Lorena enjoyed more traveling, especially to see her brother and sister-in-law Ed and Jody Friend in Arizona, caring for her elderly mother until her death, and in her last years, garage sales and “junkin” with her sister Sandy Suggs. She was a diehard OU and Broncos fan and enjoyed Sunday afternoon football with her son, Tod. She and her daughter, Christie, spent many hours together “just going” and she was ready at any time. Lorena was a loving but stern grandmother to Josh and Jake Todd. The most recent joy of her life was spending time with great-granddaughter Cypress Grace Todd, who knew her as “Ole Gran”. Lorena was a member of Faith Tabernacle Church and loved the preaching and teaching of Pastors Don and Norene Stanton. She always sat in the front row so she wouldn’t miss a word. 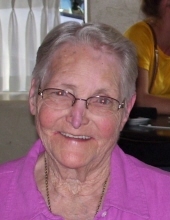 She loved to cook steak fingers, fried chicken, and mashed potatoes and gravy for Pastors and other dear church friends. She was a great basketball fan and attended as many games as possible. She enjoyed watching Chrissen, Crayton, Christonya, and Chrislyn Harland and bragged on them constantly. She was preceded in death by her son, Tommie Morris, parents, Tom and Rena Suggs, former husband, Jess Morris, grandparents, Jake and Maggie Hargraves, Ethie and Walter Suggs, and numerous loving aunts, uncles, and cousins. She leaves to cherish her memory her daughter, Christie and husband Brad Woods, son, Tod and wife Edna Morris, brother, Ed and wife Jody, sister, Sandy Suggs, grandsons, Josh and wife Cassie Todd, Jake and wife Brenda Todd, great-granddaughter Cypress Grace Todd, best friend, Debbie Day, as well as many cousins, friends and her dogs, Taz, Katherine, and Army. She battled and beat many obstacles in her life, including lung cancer, and she is the final victor in this battle of life due to her faith and belief in Jesus Christ. In lieu of flowers, memorial donations may be made to Faith Tabernacle Church, 501 S. 5th St. Ponca City, OK 74601 or the Ponca City Humane Society, 900 W. Prospect Ave. Ponca City, OK 74601.